Preside over the intersessional programme of the Convention on Cluster Munitions (CCM) i.e. from the last day of meeting at which presidency is assumed to last day of following Meeting of States Parties (MSP) which are normally held in the first week of September for 3 days. The CCM Implementation Support Unit (ISU) provides technical and administrative support to the Presidency and Coordination Committee. Prepare and preside over the MSP/Review Conference (RC) – in collaboration with the Coordination Committee, the United Nations Office for Disarmament Affairs (UNODA) and the ISU. Draft daily scripts are provided by the UNODA in collaboration with the ISU. Geneva is the default location of CCM MSPs but the Presidency can choose to host it in its country. Chair meetings of the Coordination Committee as necessary – usually once a month. The ISU prepares the Agenda and drafts the Minutes in consultation with the President. Coordinate the activities of the members of the Coordination Committee (14 States) and report back at the annual MSP at which s/he presides. Lead the implementation of any decisions taken by States Parties and report back to them within the stipulated timeframe. Issue public statements as necessary on behalf of the Convention’s community to promote the objectives of the CCM and to strengthen the norm against use of cluster munitions. 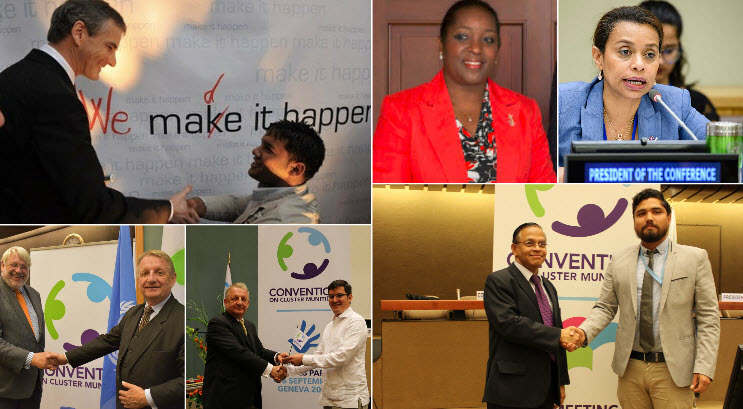 Promote implementation and universalization of the Convention through various activities; including delivering CCM related statements at appropriate fora. Spearhead the search for the following 2 Presidents taking into consideration regional balance. Lead efforts to ensure that sufficient resources are available to fund the operations of the ISU. All activities are conducted with the direct technical support and advice of the Implementation Support Unit (ISU) as stipulated in its mandate. The core mandate of the ISU is to provide the necessary substantive support and advice to the President and Coordination Committee to ensure the Convention on Cluster Munitions (CCM) is on track with its implementation objectives. The United Nations convenes the Meeting of States Parties (MSPs) and the Review Conferences (RCs) to the CCM and is mandated by the General Assembly of the United Nations to render the necessary assistance and to provide such services as necessary to fulfil the tasks entrusted to the United Nations. Inter alia, the UNODA supports the Presidency in the preparations, conduct and final reporting of these meetings, provides cost estimates for future meetings and ensures provision of secretariat services (including documentation). The office of the CCM President is normally held for a 12-month period. The Presidency term of office commences on the last day of the preceding Meeting of States Parties (MSP) up to the last day of the MSP at which it will itself preside. For example, the 9MSP President’s mandate commenced on the last day of the 8MSP at which it has been elected. Thereafter, from that September to the next one, the elected State will preside over the implementation of the Convention. The Presidencies over the past years were: Lao People’s Democratic Republic (1MSP), Lebanon (2MSP), Norway (3MSP), Zambia (4MSP), Costa Rica (5MSP), Croatia (1RC), the Netherlands (6MSP), Germany (7MSP), Nicaragua (8MSP) and currently Sri Lanka (9MSP). At the 8MSP, Switzerland was elected President of the Second Review Conference to be held in 2020. The President of the approaching MSP / RC leads the preparations for that meeting. This includes both the substance that will be discussed during the meeting as well as overseeing the logistical arrangements for the successful hosting of that meeting. In this task the Presidency works closely with the Coordination Committee, the ISU and the UNODA which performs the role of the Secretariat of the meetings. These are held once every year usually in September. The incoming President takes up office on the last day of the meeting of the current year and then presides over the preparations for the subsequent MSP over the following 12 months. The meetings are held by default in Geneva and the budget is approved at the prior MSP. However, the Presidency has the option to host the meeting in its home country. Additional costs to the budget already approved by the States Parties have to be borne by the host State. Welcome reception hospitality – opening ceremony, entertainment, etc. This list is not exhaustive but gives a general picture of some of the costs that the host country would have to cover. For more information download the brochure on the Role of the Presidency.